This room contains a very comfortable double bed. This large room is on the ground floor and has its own private entrance with a flag stone floor. The room is suitable for guests with reduced mobility, there is one step down into the room and to access the main house a couple of steps up and down. 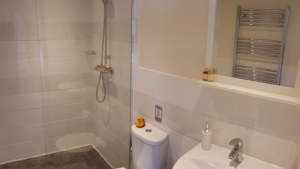 The luxurious wet room bathroom offers a great place to freshen up, with a very large shower cubical, then wrap yourself in a luxurious towel and relax.